With OS X Mavericks, single-clicking an application icon in the Dock launches that application or, if the application is already open, switches you to that application and brings forward all open windows in that application. Press and continue to hold down the mouse button. If you use a trackpad or a Magic Mouse, a two-finger tap will do the trick, too. If an application isn’t running, you can use either method to display a menu. Choosing Open launches the application; choosing Show in Finder opens the enclosing folder (in this instance, that would be the Applications folder) and selects the application’s icon; choosing Remove from Dock removes that application’s icon from the Dock (waiting until after you quit the application if it’s running); and Open at Login launches this application automatically every time you log in to this user account. If an application’s icon isn’t already in the Dock, you see Add to Dock rather than Remove from Dock. Show Recents is a relatively new feature, introduced in OS X Lion. Not all applications offer this useful feature. Choose it, and icons for recently used documents appear above the Dock. Hover your cursor over a document icon to see its full name (What’sNewinOSX.pdf). Last but not least, if you press and hold or right-click/Control-click an open application’s Dock icon, you might see a menu like these ones. So there you have it: That’s the default Options menu, which is what you’ll see for most applications when they aren’t open. When an application is running, however, its Dock menu usually looks quite different (clockwise from top left: Safari, Preview, System Preferences, TextEdit, and Calendar). 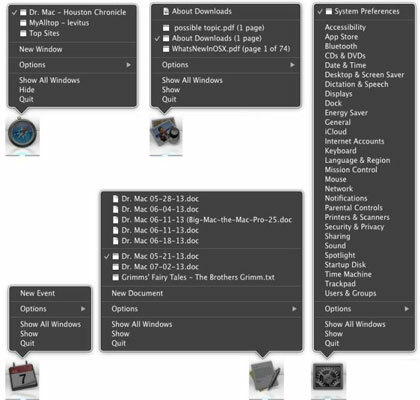 Some applications — such as Calendar, Mail, and System Preferences provide useful program-specific commands or options. iTunes has a Dock menus, letting you control your music from the Dock with options such as Play/Pause, Next Track, Previous Track, Repeat, and Shuffle. Other programs, including Preview and Safari, offer you a list of open windows with a check mark to indicate the active window. Finally, the items above the list of open windows for TextEdit are recently used documents.